25 years of on-going coverup, lies, deceit, and treason. Balance this against 41 years of treachery, and you will begin to appreciate the nature and extent of the most important constitutional crisis confronting us since the civil war. There have been three major “scandals” in post-WWII Amercia: President Kennedy’s assassination, Watergate, and Iran-Contra. I argue they are all symptoms of the same problem: the ongoing growth and ever-expanding influence of the National Security State of America, which began in earnest when President Truman signed the National Security Act of 1947 which, among other things, formalized the structure of the U.S. intelligence community as we know it today. General Reinhard Gehlen, Hitler’s chief of intelligence for central and eastern Europe, “surrendered” himself to us in 1945. Allen Dulles, working for the O.S.S. in Berne, Switzerland since 1943, had been negotiating with high-ranking Nazis like SS General Karl Wolfe since 1943 for secret surrender plans that included enticing offers to the Western Allies like espionage information, as well as attempts to create alibis that downplayed the German officer’s participation in war crimes and genocide. Soon after the war was over, Dulles was instrumental in illegally sneaking Gehlen into the U.S. wearing an American General’s uniform, and then, along with industrialists like Herbert Hoover, Gehlen with his experience, “helped” us design and implement the structure of our own intelligence command organization. Such secret, illegal “appropriations” of high-level Nazis were by no means limited to Gehlen. Among the most treacherous and nefarious others were: SS officer Otto A. Von Bolschwing, Adolf Eichmann’s teacher concerning Jewry and Zionism; Wernher Von Braun, and his military superior General Walter Dornberger, responsible for the deaths of more than 20,000 slave laborers who were worked to death at the Nordhausen concentration camp–the second rocket production facility; Klaus Barbie, the butcher of Lyons; German diplomat Gustav Hilger, who, among his other duties at the Nazi foreign office, coordinated the operations of the dreaded SS Einsatzgruppen murder squads that were responsible for the largest wholesale atrocities and genocide committed against people in Eastern Europe and Russia. These men and many others, had been our mortal enemies. But with the end of WWII, and the beginning of WWIII (some call this the Cold War), war became peace, enemies became valuable assets, and friends became faceless enemies bent on our annihilation. This was accomplished in large part via our own budding invisible government of non-elected, behind-the-scenes manipulators, propagandists, spies, agent provocateurs assassins, “defense intellectual careerists”, powerful industrialists and financiers, and a host of good-meaning men like Truman who did not understand the long-term implications of what they were giving sanction and legality to. The three most famous scandals mentioned above are the overt surfacing from time to time of this government-by-covert-means. But the primary one is unquestionably the Kennedy assassination as this was the first time the National Security State declared itself openly and wrested control of America’s agenda away from a man who was attempting to move beyond the Cold War, stop nuclear proliferation, ease tensions with our primary adversary, find a way out of the morass of Vietnam, and redirect the industrial might of our country away from a permanent warfare economy and toward a more globally coexistent footing. fantastical and physically impossible scenario of the single bullet “theory”, would never have stood up under cross-examination in a court of law. Mae Brussell Research Center, P.O. Box 8431, Santa Cruz, CA, 95061.
events of 25 years ago. authors are L. Fletcher Prouty, and Roger Craig. tary activities were channeled through him. Defense. He also headed the Special Operations Office of the U.S.
of the clandestine operations of the CIA. Allies in Control of the United States and the World”, was published. Roger Craig was a police officer in the Dallas Police Department. Depository building identifying himself as a Secret Service agent. personnel of any kind who were stationed in Dealey Plaza that day. in the April/May 1987 issue of Freedom magazine. 1971 titled, “When They Kill A President”. that brought both men together in public appearances. channels necessary to arrange such things covertly. military establishment for assistance as necessary. fession of great precision and expertise. others were simply left out. acy and the identity of the cabal. 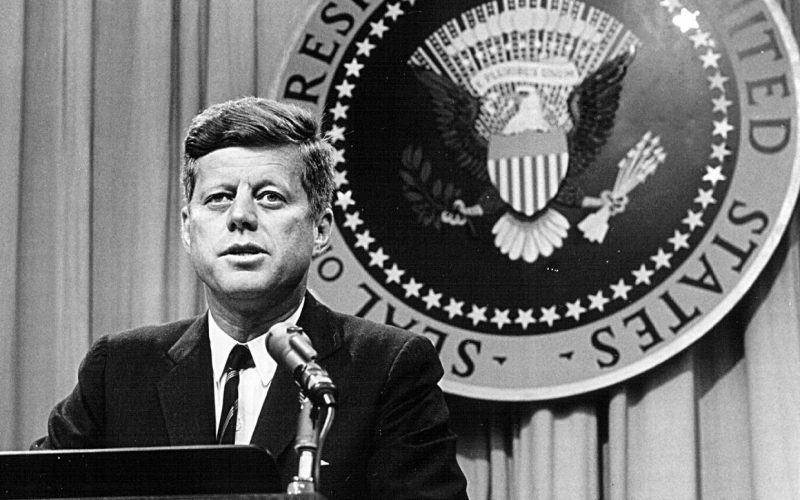 events surrounding President Kennedy’s death. security standpoint? Why was that specific route chosen? sharper [120-degree] turn from Houston to Elm Street. did he and the police accept that hazardous route? create an ideal ambush site. The Elm Street corner was it. strong evidence of the work of the conspirators. sealed and can station men to ensure they stay closed. area of the Elm Street slowdown zone. in this slowdown zone had been closed, and kept closed. directly above the sharp corner of Houston Street and Elm Street. men were on the roofs of adjacent buildings to observe such lairs. to have come from a very high level. other than Oswald, by himself, had committed the crime. chief justice of the Supreme Court, had to know that. Hospital in Dallas, burn his original notes? ers in Dallas said the president was hit with a “burst of gunfire”. rifle of the Warren Report. Worth.” Whose getaway car? Oswald never left Dallas. and will bear no resemblance to the original, true accounts. gunfire when they hear it, and they reported “bursts” of gunfire. saw. They did not yet have propaganda handouts. Neither the FBI nor the Secret Service reported such action. simultaneous gunfire sounded like “bursts” of “automatic weapons”. was included on page 3. Oswald had been charged with the crime. It was pure propaganda. Where did those wire services get it? on call, in those first hours after the assassination. said, and the “Star” published, some very interesting information. “unexpected” event–even before the police had charged him? prepared the patsy and all of that intimate information beforehand. the Dallas police force instantly declared Oswald to be the killer. Lt. Day inspected the rifle briefly, then handed it to Capt. Fritz who had a puzzled look on his face. Seymour Weitzman, a deputy con- stable, was standing beside me at the time. Weitzman was an expert on weapons. He had been in the sporting goods business for many years and was familiar with all domestic and foreign weapons. Capt. Fritz asked if anyone knew what what kind of rifle it was. Weitzman asked to see it. After a close examination (much longer than Fritz or Day’s examination) Weitzman declared that it was a 7.65 German Mauser. Fritz agreed with him. very low, “Everybody will know who I am now.” At this time Capt. the man entering the Rambler station wagon was Lee Harvey Oswald. on Beckley Avenue and a straight shot to Oswald’s rooming house. involved would have made it a CONSPIRACY! …Combine the foregoing with the run-in I had with Dave Belin, junior counsel for the Warren Commission, who questioned me in April of 1964 and who changed my testimony fourteen times when he sent it to Washington, and you will have some idea of the pressure brought to bear. my left was a female with a pencil and pen. Belin sat to my right. “For instance, I will ask you where you were at a certain time. would again start the recorder. What was the next question? “Mr. tone and attitude–disappointment at being exposed! record in the case files or any place else. Dan Quayle’s legislative aide was Rob Owen, who was intro- duced to John Hull in Quayle’s senate office in 1983.
ko.yan.nis.qatsi (from the Hopi Language) n. 1. crazy life. 2. life in turmoil. 3. life out of balance. 4. life disintegrating. 5. a state of life that calls for another way of living.